This motel is 4 miles from Washington Park Beach and 8 miles from Indiana Dunes National Lakeshore. 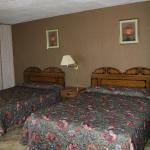 The motel's front desk is staffed 24 hours a day.Guest rooms at the Golden Sands Motel have a seating area and a TV. They are also equipped with air-conditioning and heating. All rooms offer free Wi-Fi access.Free parking is available at this fully non-smoking motel. Interstate 94 and Interstate 80/90 are easily accessible.Four Winds Casino is 7 miles from this motel. Blue Chips Casino and Washington Park Zoo are 5 miles away. Michigan City Municipal Airport is 7 km away.